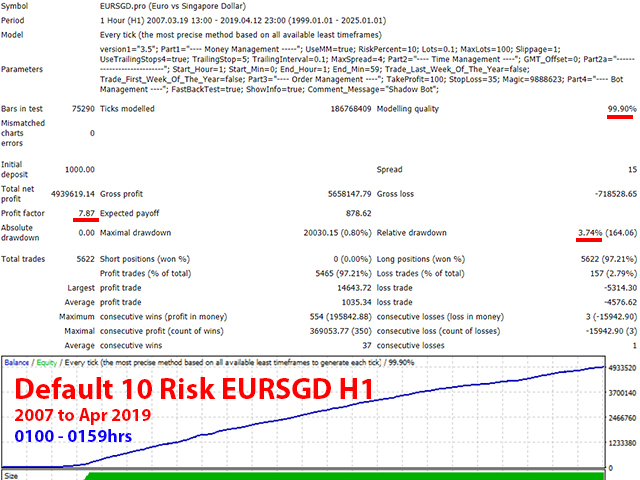 Shadow Bot is mainly designed for trading the EURSGD H1 timeframe on a low spread EURSGD ECN broker. It trades mainly during the asian session. It primarily waits for a valid trade opportunity before executing the trade orders. Once in sight, it will execute the order and proceed to manage the order from there. There is no martingale/grid/averaging/hedging used for this particular strategy. Stoploss is given for every single trade to minimize the risk. Default setting is mainly for the purpose of having an overall low risk drawdown portfolio and pre-adjusted primarily with capital preservation in mind. The bot ai algo is fully automated. You may adjust the risk as according to your desired risk appetite. Just drag and drop and attach the EA to your EURSGD H1 chart. If you're using this bot with other EAs, please make sure that your magic numbers for each bot are different. Commissions: Standard $5-$7 round turn is fine. GMT_Offset: GMT Offset (in hours) - Keep it at "0"